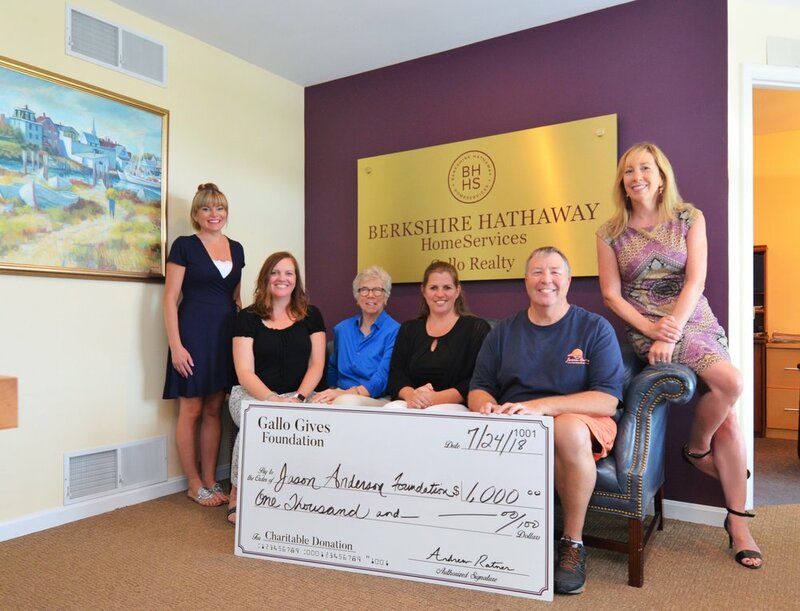 The Gallo Gives Foundation, established in 2016, is the charitable arm of the Berkshire Hathaway/Gallo real estate company. It is funded mainly by their agents and staff, who contribute a portion of their commission income at each closing. Each quarter, a panel of agents decides on contributions to area charities. The foundation also offers two $2,500 scholarships each year to graduating high school seniors. One scholarship to a student pursuing a 4-year degree in Business, and one pursuing a 4-year degree in Environmental Studies. The mission of the foundation is to support local organizations in need of help, and to enhance the presence of the arts in Sussex County, Delaware. The Jason Anderson Foundation is honored to be a recipient of one of the 2018 Gallo Gives Foundation awards. Marc Anderson, Foundation President (second from right), and Kathy Newcomb, Foundation Board member (third from right) receive the Gallo Gives award from Trish Ratner (far right) and her Gallo team. The full article covering the Gallo Gives awards can be found on Cape Gazette's online publication HERE.